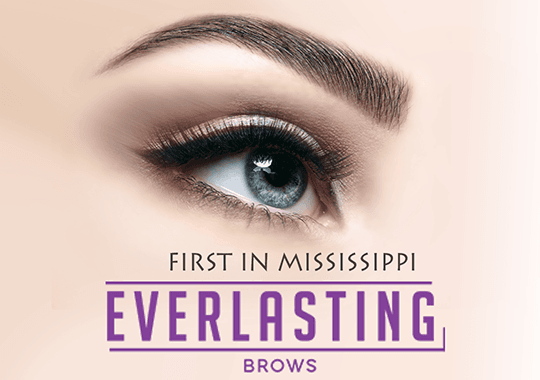 Introducing a first for Mississippi: Everlasting Brows, exclusively at Runnels Center. Last up to 18 months! This impressive, new technique allows you to create the desired brow shape and fullness unlike the old permanent tattoo methods. Every individual hair is drawn precisely, yielding an exceptionally natural and celebrity-worthy appearance. The effects last up to 18 months after which the pigment fades leaving the skin and your natural brows exactly as they were, allowing you to change with the times. Whether used for shaping, thickening or replacing Everlasting Brows is for anyone who wants to look their best and never fuss with brow makeup again. Want to get the most out of your brow? Call 601-939-2457 NOW to make an appointment for May. Click to view before and after photos!